I had exactly two ripe bananas in the house. Do you know what that means? It’s banana bread time... You know, like Hammer time? I used to love the song, U Can’t Touch This! Who am I kidding? I still love it! I am dating myself, but it is an oldie but goodie. Did anyone else watch the music video over and over to try to learn the dance steps? No? Anyone? Just me? Okay, that’s embarrassing if I’m the only one. Anyway, you can touch this banana bread and I hope you do because it’s SO delicious. Let me break this down for ya. (That’s the last reference to the song, I promise. 😉 ) I love my Classic Banana Bread, which I first made many years ago (pre-blog days). It’s one of my favorite recipes of all time because it’s tasty, easy to make and everyone loves it. Then I made my Light Banana Bread some time last year. It contains less sugar and fat but it’s equally delicious compared to the classic version. Cool, right? Also, the light recipe is not as dense as the classic. At the end of the day, both recipes are awesome. This banana bread recipe is sort of in between the classic and light recipes. Meaning that I took the classic recipe and reduced the sugar a bit and I swapped the sour cream for Greek yogurt. However, it’s not healthy as the light recipe because I went ahead and added sugar back in by way of chocolate chips. I recently made Banana Brownies and they were on my mind. Chocolate chip banana bread is not a new invention by any means, but I knew I wanted to recreate the fabulous chocolate and banana combo in a way that I hadn’t done before. 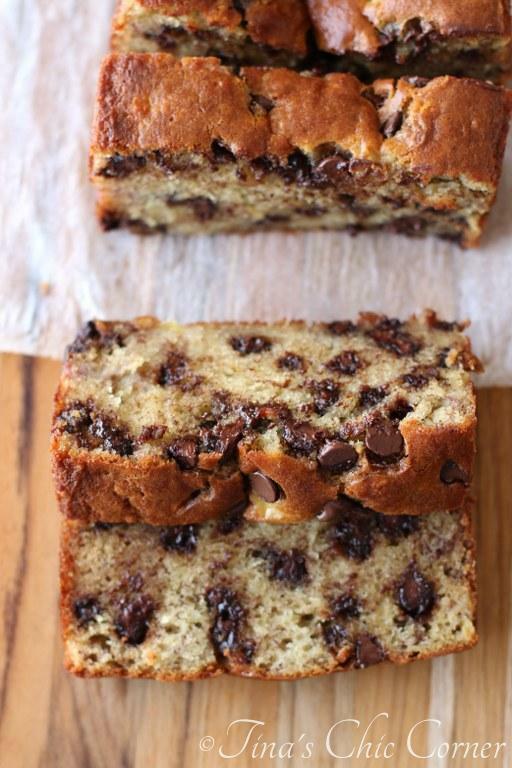 Can you believe I’ve never made chocolate chip banana bread until now?! Crazy talk. As you can tell from the pics, the chocolate chips are all melty and gooey. Patience is not one of my virtues. I just couldn’t wait to dive into it. Get a big glass of cold milk ready! Banana bread is great but when you add chocolate bits to it the bread jumps to a whole new level of grandiosity. It’s scrumdiddlyumptious. That’s all I can say. Please don’t ask me to pick which banana bread I like best (the classic, light, and now this one) because I seriously love them all. I would make them over and over again, if only I had an endless supply of over-ripe bananas. My secret approach is to always just make the one I’m in mood for or that someone has asked for. Who else has the M.C. Hammer song stuck in their head now? Sorry! Add in the yogurt and the mashed bananas and mix until just combined. Spread evenly into a greased 9 x 5 loaf pan. I use the Fat Daddio loaf pan. Bake for 55 minutes or until a toothpick inserted into the center of the loaf comes out clean. If you stab a chocolate chip, try again. It might be done even if you have chocolate goo on your tester. Cool the loaf in the pan for at least 15 minutes before cutting into it. Check out the Chocolate Chip Banana Bread Muffins! I didn’t change a thing with the recipe and the only differences are the pan and the cooking time. Check out the Banana Bread Doughnuts, using this same recipe! Just in time…I have three ripe bananas. I think I’ll make this tomorrow. Thanks Tina! You aren’t alone dating yourself – I love the song too. Oh, and the Banana Bread – I love the it too! I’ve had a hunger for banana bread, and went to the grocery store to find only yellow/green bananas 🙁 but remembered a tip on how to speed up the process for them to ripen-I’m using this recipe w/the tip..and I’m sure it’ll be delish! My daughter will be soo happy after school lol. GL on your next loaf! This is the best one I’ve tried yet!!! I used dark chocolate chips, instead of semi sweet chocolate chips. I did Mini Loaves, instead of one 9×5, and the best part only 30 minutes instead of 55!!! Didn’t have to wait as long !!! SUPER YUMMY, SOFT, and MOIST!!! Oh and I also am impatient, and put them right on a cooling rack right out of the oven. My mini loaf pan only has 8 spots, so I had four more left to fill. Hehe. Looks delicious! Any idea how this would fare making it over 7000 feet? I’m having a hard time finding a banana bread recipe that works at this altitude and am missing that chocolate / banana goodness! If you end up trying this banana bread, whether you alter the ingredients or not, I’d love to know how you make out. Good luck! Hi was wondering what I use instead of Yogurt !!?? Fay, I’ve used sour cream instead of yogurt. Best Ever!!! Soo good it should be prohibited, that good!!! This was delicious!! I used a mixture of semi sweet chocolate chips and milk chocolate chips and it was yummy. Only problem- all my chocolate chips were at the bottom of the bread 🙁 I mixed them in well, but when baked, all the chocolate was at the bottom. Not sure why! I didn’t have any regular Greek yogurt on hand, so I used vanilla flavored Greek yogurt. Maybe that had an effect? Either way, very yummy!! If you shake your chocolate chips in a ziplock Baggie of flour before adding to the mixture it helps with the sinking to the bottom. Gah! I thought I responded to you, Madi…until I saw Dawn’s comment. I agree with Dawn that mixing the chocolate chips in a about a teaspoon of flour helps to prevent the chips from sinking. However that doesn’t work 100% of the time for me so I don’t usually include that step in the instructions. Hi! What’s a good substitute for greek yogurt? Hi Lexi. I’ve used sour cream instead of yogurt. OH GOOD!!! Just reading the comments now. I have mine with sour cream as I have no yogurt I want to use. I was searching through the comments to find this exact question! Thanks to sour cream I can make this tomorrow! Any substitute for greek yougurt? You can use sour cream instead of yogurt. Really good! I’ve made it in loaf form and mini muffin form too now and it has been great each time- gets lots of compliments ? I’ve also just used one of my sons strawberry yoghurts when I didn’t have Greek yogurt- just as yummy! Thank you very much for this recipe, I love it ? Used mayo instead of yogurt and it worked just fine. So yummy, this is my new favorite. I never thought to use mayo instead of yogurt… good to know! I’m so glad this is your new favorite. 🙂 This one is definitely a favorite in our home! I made this tonight and it was absolutely delicious! I didn’t have any vanilla extract immediately available but my greek yogurt was flavoured vanilla so i gave it a shot and hey, it worked great! I also had a little extra batter so i made 6 little muffins as well for breakfasts and snacks! Love this recipe and will use again for sure! Awesome! I’m glad you love it even with the modifications. 🙂 I’ll have to keep the vanilla yogurt trick in mind. does it matter what percent the greek yogurt is? afraid it will affect the density of the cake. so excited to make this! running to the store for some missing ingredients. thanks for the recipe!! Natasha, the percentage does not matter. I’ve used a variety and they all come out great. However, it is important to use Greek yogurt because it’s thicker than non Greek yogurt. Let me know how you make out! Really excited to try this recipe, its part of my father in laws 70th birthday gift!! I used mini SS chocolate chips and sprinkled chopped walnuts on the top…but the kicker is I made mammoths muffins instead of a loaf… having to guesstimate on my time but excited to see the results in a few minutes! Do you just use plain greek yogurt or flavored at all? I use plain Greek yogurt. But some of my readers have used flavored yogurt & like that. I had to alter this, bobs gluten free flower, sour cream since I had no yogurt, and 3 ripe bananas since I couldn’t leave the one out. Neighbor had small chocolate chips for us and Bam, we have a baking project for my 7 year old with out waiting! FEW!!! I love that you made this recipe your own! How did it come out? It was fantastic! With GF flour you need to consume quickly or place in fridge and reheat. We did both. Neighbors and friends loved it, with more orders to come! Ty for the recipe. Just lovely. Ashley, you can use sour cream instead of yogurt. This was the best banana bread I have ever made! Thank you! What if I don’t have Greek yogurt?! Would sour cream work? Yes, sour cream will work instead of Greek yogurt. Ashley, I’m sorry to hear that. Every oven is different. If you try this recipe again, I would suggest laying a piece of tin foil on top of the bread once you think it’s done cooking on top, but keep it in the oven cooking until it’s done cooking in the middle. The foil will minimize any further browning on top, while it still continues to bake in the middle. I hope that helps. I am looking through the Recipe which looks amazing and I will be making this but I wondering what size Loaf tin you used for this? Scott, I use a 9 inch by 5 inch loaf pan. This banana bread was perfect!! We used sour cream instead of the yogurt and it as delicious! My young daughter followed the recipe and it turned out perfect. I’m wondering if this recipe can be doubled? I do a lot of big group cooking, but some recipes don’t double well. Any thoughts? Hi! I love this bread! Have made it like 5 times in the past few months. I made it for my sister and she has a diabetic son. Do you know how many carbs are in a slice? Thank you! Sandy, I’m SO happy to hear how much you love this bread! 🙂 I’m sorry, but I don’t track the nutritional value on recipes. I have frozen ripe bananas available? Do you think they could work? Yes, absolutely. I use frozen all the time. Make sure you bring the frozen ripe banans to room temperature first. This recipe is downright awful. It’s too moist and heavy for it to possibly be a bread! I just made it, followed your instructions exactly and it looks just horrible. The whole bottom got stuck (despite buttering the pan heavily) and the chocolate chips all sunk leaving it a gross chocolate-y mess. I’m not an expert baker, I know that, but I’m not bad enough to be blamed completely for how this turned out. Absolutely no idea how you got the bread to look the way it does in your images, but I think this recipe should be changed drastically. Won’t be making again. I’m sorry to hear that this recipe didn’t work out for you. I don’t have yogurt or sour cream, is there anything else I could use? Or do I have to use yogurt or sour cream? Sorry, Tamara… I’ve only ever used Greek yogurt or sour cream. I don’t know of another substitute that would be equivalent. Maybe applesauce? I swap back and forth with yogurt, applesauce and sour cream in different recipes….depending on what I have on hand. I always use unsweetened all natural applesauce though. The photo looks like you used parchment paper instead of greasing the pan? Which is best? Thanks so much! Tracy, I use both methods and both work. However, I tend to favor parchment paper more in general because I know that 100% of the time I will have no issues removing the entire loaf without any issues. I tried this recipe today..added 3:1 ratio of white and brown sugar..and a couple spoons nutella…!! Tastes absolutely amazing…so soft..and yummie..??? puts the Starbucks bread to shame!! ? It was perfect! Not too sweet and not too mushy. Thank you. This looks so good! Love banana and chocolate together! I made this tonight and used the Reese’s peanut butter chips instead of chocolate chips. It’s insanely good! Oh my goodness that sounds amazing! Why didn’t I think of that… I love reese’s peanut butter cups! I must try that next time. Seriously awesome idea! I like using brown sugar in my banana bread recipes, do you think if I use all brown instead of white sugar that it would turn out okay? Megan, I’ve never tried this recipe with brown sugar. They are different so I’m not sure if the texture or flavor would turn out different. If you end up trying it, let me know! I did end up trying it and it was absolutely divine! Best banana bread recipe I’ve used. I used brown sugar and sour cream, loads of chocolate chips (which the shaking them in a bit of flour trick works wonders) and of course walnuts ? my husband said it was definitely my best batch yet. I made these into muffins and they are seriously perfect, even being just sliiightly over cooked due to winging it for bake time. I used vanilla Greek yogurt. I will be making these again for sure, thank you!!! I’ve totally got to try this recipe in a muffin version now!! This was the most amazing banana bread recipe I have ever tried. It was so moist, and cooked so perfectly. Thank you so much. This recipe is my favorite recipe of all! Do not take the bread out of the oven at 45 minutes, even though it looks done. Trust me, I learned it the hard way!!! Keep baking it for ten more minutes with foil in the oven. If you stop at 45 minutes and cut it open, the batter will come rushing out! It was fun and easy to make. Good idea on the yogurt – it made it soft, moist, and delicious! I will make this recipe again. I highly recommend this recipe. It was definitely five stars with everything! Another tip about the chocolate chips is that using dark chocolate Hershey’s semi sweet chips is very nice and soft. I don’t like dark chocolate but it still tasted great! Also, I put a cup and a quarter cup in the bread and it was just enough. It was much better with more. I really enjoyed this recipe, and i think you will too! Hi Sandy! I’m so glad that you love this banana bread!! Unfortunately I don’t use a nutritional calculator but you can find many sources online to give you the information that you are looking for. Best Banana bread I’ve ever made or eaten! I did substitute with sour cream and used a smidge less than recommended as I used thawed frozen bananas and they were very moist. Soooooo delicious! I’ve never made any kind of bread in my life, but I had 2 ripe bananas and thought I’d try this. It was easy and it was GREAT! Thank you for helping me feel like a success in the kitchen. I made this tonight (doubled the recipe), used less sugar and coconut Greek yogurt instead of plain or vanilla! Oh, and I used Ghirardelli semi-sweet chips. To die for!!!!!! Just made 2 loaves and boy are they yummy! Taking them to work in the morning; we’ll see what the co workers think! My go to recipe for banana bread from now on! I have been looking for a staple recipe, thanks! Great recipe. So easy!!! I used brown sugar instead and added both cinnamon and cloves. Will make this my go to banana bread recipe. The best thing I ever did to my banana bread ( aside from adding chocolate chips lol) was to bake them in muffin trays lined with easy release foil cupcake liners . Grab one as you head out the door or toss one in the lunch bag.. easy Peasy! I was looking for something to do with my very ripe bananas and quite honestly looked at your recipe because of your name 😉 I did not have greek or regular yogurt and as I was reading through your comments I saw the applesauce substitution and luckily I had some! Let me tell you I have NOT been able to stop eating it. I made a double batch and put one in the freezer to keep it away from me. I will be making more in the next week for holiday visits with family and friends and they are gonna die!! Thank you so much! Can’t wait to check out your other recipes. I made this on Christmas morning for the first time and it turned out delicious! The ingredients didn’t specify a flavor of Green yogurt, so I opted for Vanilla, which was great. Thank you for sharing this recipe!